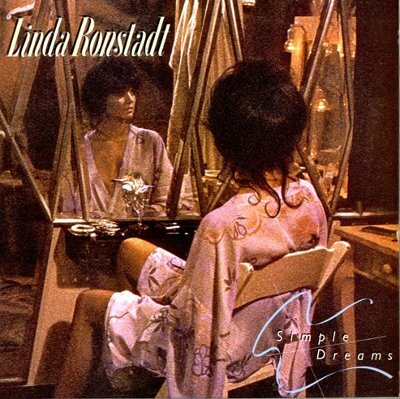 Home / -Preview- / Linda Ronstadt / Preview / Linda Ronstadt Expands 1977's "Simple Dreams"
Linda Ronstadt Expands 1977's "Simple Dreams"
Either there just isn't a lot of archive material in the vaults or someone is waiting to do a descent job of expanding the Linda Ronstadt catalog. With one of the most expansive careers ever, genre-wise, Ronstadt should be able to generate major new sales with some decent expansions of her catalog including demos, studio outtakes and, most importantly, archived live concerts; however, for her upcoming expansion of Simple Dreams, the record company has decided to just add three live interpretations of the hits from the album. Simple Dreams was the eighth studio album for Ronstadt and her second, after 1974's Heart Like a Wheel, to top the Billboard 200 Albums chart. It also became her biggest studio album in the U.K. where it went to number 15. The album produced two top ten singles, Blue Bayou (1977 / #3) and It's So Easy (1977 / #5), which held the distinction of both being in the top five at the same time, the first time it had ever been achieved by a female vocalist and the first time any artist had done it since the heyday of the Beatles. The album also includes Warren Zevon's Poor, Poor Pitiful Me (1977 / #31), a cover of the Rolling Stones' Tumbling Dice and takes on two traditional songs, I Never Will Marry and Old Paint. The only extras on this "expanded" edition are live versions of It's So Easy, Blue Bayou and Poor Poor Pitiful Me, all taken from a 1980 HBO special. It would have been better to have had a whole show from 1977 on a second disc. When I was little, I seriously thought "decent" was spelled just as your writer did it in the opening graf of this article. What a bloody shame that even the best word software doesn't have (or needs to be manually taught) spelling quirks that involve otherwise-legitimate words.